City lawyer Jonathan Pines worked represented New York City in St. Bartholomew’s Episcopal Church v. City of New York. He shares his experiences from the case and working with Dorothy Miner. Jonathan Pines joined the New York City Law Department in 1984 in the general litigation department. He’s worked on a number of important cases for the city, including St. Bartholomew’s Episcopal Church v City of New York, where he worked closely with Dorothy Miner and Lucy Cardwell. He speaks about the main arguments they used in the case to argue for the city’s right to deny the church’s application to demolish the landmarked community house and his role in the case. The case dealt with the takings clause of the Fifth Amendment, and helped to establish precedent nationally for the legality of landmarks preservation laws. 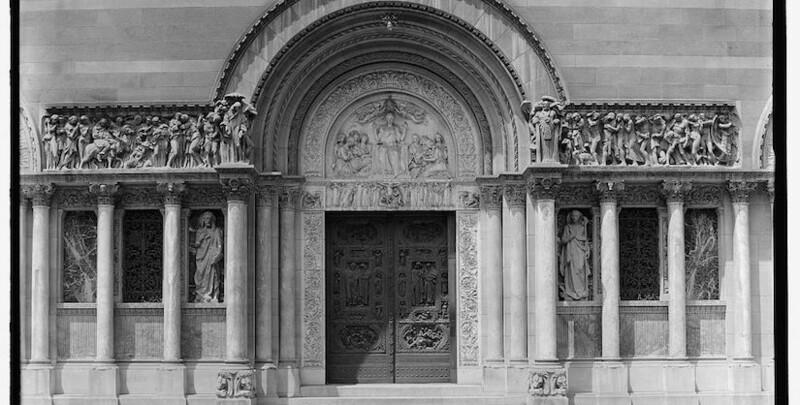 He worked primarily with the arguments regarding the administrative record, showing that the church had not done its due diligence in the architectural research or hardship application to the New York City Landmarks Preservation Commission. Q: I’m sorry, October 16, 2017. Thank you, Jonathan for the correction. We appreciate your taking time today to talk to us about your work in the preservation world and your role in some key cases. If you don’t mind, sharing maybe a little bit of background about where you grew up and where you attended law school. Pines: Sure. I grew up across the river in Tenafly, New Jersey, a bedroom suburb of Manhattan, went to Columbia [University] undergrad, went to [Benjamin N.] Cardozo Law [School], did my first work out of law school at the NYCLU [New York Civil Liberties Union]. I stayed there for a couple of years working on an inmate class action. After that, I applied for a position with the corporate counsel of the New York City Law Department where I’ve been since 1984. I’ve stayed in the general litigation division that handles virtually any systemic kind of institutional case, including some landmarks cases. Q: In your past, have you ever been personally involved, apart from your litigation work with the city, with any preservation issues or battles? Q: When did you first, I guess, learn about the concept of historic preservation? Pines: I have a feeling my introduction—I mean I knew about it generally. Living on the Upper West Side of Manhattan, I’m certainly aware of historic preservation districts and historic preservation buildings. But it was very whatever I read in The [New York] Times kind of a level of knowledge. As a very junior attorney, I think maybe—I came to the law department in ’84, so maybe in ’84, ’85, ’86, I was assigned a case regarding a church on West End Avenue, just twenty blocks down from here called the Church of St. Paul and St. Andrew which had gotten—I’m fuzzy a little bit on the details but it had gotten a historic preservation designation. They wanted to do some sort of modification and they went to court before fully exhausting available remedies under the [New York City] Landmark Preservation Law. So that case came to me. I identified an exhaustion argument, basically saying they hadn’t exhausted the available administrative avenues. So they weren’t entitled to judicial relief. My recollection is the case went off on that basis. But that was when I first became—I got my feet wet on some of the provisions of the Landmark Preservation Law and the appreciation of the various issues that commenced. Q: Do you remember working with any certain attorneys during that time? Pines: I had a supervisor, a woman named Susan [unclear] who I don’t think was any more familiar with the law frankly than I was, but she was more familiar with legal issues. She supervised my writing. But no, I did not have supervision in that area of the law. Q: And then apart from that case, has the St. Bartholomew’s [Episcopal] Church case [St. Bartholomew’s Episcopal Church v. City of New York] been your only other preservation law case in your recollection? Pines: Yes, I think it is. I think that was it. Q: Thank you. So we’ll focus on St. Bart’s today. Thank you for that. So maybe just by way of setting the stage, for those who might be listening to the interview but may not be familiar with St. Bart’s or St. Bartholomew’s Church, commonly called St. Bart’s. It’s a historical Episcopal church, founded in 1835. It’s currently located on the east side of Park Avenue, between Fiftieth and Fifty-First Streets in midtown Manhattan, in New York City. In terms of our talk today, we’re here to discuss the controversy that flowed from the landmark status that was bestowed upon this church, which was designated a landmark by the New York [City] Landmarks Preservation Commission in 1967, a move that was opposed at the time by the rector and vestry. But beginning in 1981, St. Bartholomew’s found itself the subject of a highly publicized case of which you were a part of later on concerning the air rights to its adjacent building, thus setting the stage for a battle between development and the New York City Landmarks Commission. As I recall, I attended church at St. Bart’s occasionally when I lived in the city and it was my recollection that there was a big divide among the parishioners of the church, about whether to go forward and to replace the community house with an open terrace with a speculative high-rise commercial structure. I believe the proposal was for fifty-nine stories. Pines: It varied at the time but I think you’re right. Q: Maybe the initial proposal was fifty-nine stories, and would allow the church to receive rent to help replace the parish’s depleted funds. So following a public hearing, the Landmarks Commission denied that initial application. The case that we’ll talk a little bit more about today, St. Bartholomew’s Church v. The New York City Landmarks Commission raised important constitutional questions, which I believe were novel at the time. In 1989, the U.S. District Court for the Southern District of New York rejected the parish’s claim, upholding the constitutionality of the Landmarks Law as applied to the property owned by the religious group. Then the U.S. Court of Appeals for the Second Circuit affirmed that decision in 1990. The U.S. Supreme Court denied certiorari, in other words declined to hear the appeal in 1991. Suffice it to say at least in the preservation world, this was considered a victory for historic preservation. So I appreciate you letting me lay that summary for folks who may not be familiar with it. How did this case come to be assigned to you? Did it land on your desk by your supervising attorney? Pines: I don’t think—it might have. I think because I came from the NYCLU and I had been identified as something who was interested in interesting constitutional issues and could write. That might have been the reason. I mean I was too junior at the time to be privy to the deliberations. What I know is that somebody said, “We’ve got a really interesting case here that you might be interested in joining into.” That’s really all I knew. I kind of realized this was going to be a huge case, a lot of work but very interesting stuff. Q: I believe I have this right but this was—this case sort of came to a head at a time where the Landmarks Law not just in New York—not just in New York City but statewide, various landmark laws were under a lot of pressure. In New York City, for example, I believe eight out of nine financial hardship applications in over twenty years had moved forward and ultimately approved to allow demolition in some cases. So yes, this case certainly had a lot of attention from the preservation community. Were you familiar with the church itself at the time? Pines: No. Until the litigation came to be, I sort of familiarized myself. No, I had no knowledge of the church at all. Q: Did you ever encounter Virginia Waters? Pines: Sure, she was in administrative law and I was in the general litigation division. Virginia had a wonderful reputation. The work frankly was divided in ways that I hadn’t—I still can’t really explain; some of the Landmarks Law cases went to administrative law, some came to general lit [litigation]. It may be just if it was determined that the constitutional issues predominated or whether local law issues predominated. But I just frankly don’t know. Q: That’s fine. Do you remember anything specific about working with Virginia? Pines: We didn’t work directly together. We didn’t work on this case together. I worked with a woman named Lucy [A.] Cardwell. She was in general litigation at the time. No, Virginia and I, we talked occasionally, not frequently, but we worked on parallel tracks basically. Pines: Yes. Len would have worked—because he’s the appeals chief—he would have worked closely with the trial attorney in cases where he anticipated he was going to be heading to the Supreme Court or he pretty much knew that would be the case. This was not that kind of case. I may have spoken to Len—I spoke to Len, we worked very closely in my division and appeals. So I wouldn’t be surprised if we consulted. But I actually don’t recall that quite so much. I was as much under the tutelage of Dorothy Miner, as I was under the tutelage of Len Koerner. Dorothy was my mentor in this process. I’m sure you’ve heard from other people. Q: Yes. A big force in preservation and in advocacy for the city. Pines: A huge force. I mean I would chalk up the success of St. Bart’s—I’m not being self-effacing—I would say ninety percent of the work that resulted in the outcome at St. Bart’s was the hard work that Dorothy did at the administrative level, just making the record. But we can get to that. So I didn’t talk with Len a lot about this case specifically. Q: So you mentioned Dorothy had laid the groundwork for the administrative record. What do you recall about how the case presented itself to you? Pines: Sure. Soon after I got the case, I was introduced to Dorothy who—I understand you never met her, right? Pines: She was in a quiet, scholarly way a force of nature. As soon as you met her, you knew—I mean she was a woman who had no pretense of vanity or anything else. She was purely substance. This is a woman who as soon as you talked to her, you knew she didn’t want to waste any time. She had a mission and the mission was—the mission of the agency and the preservation of the city. And her knowledge was encyclopedic. But it was still very daunting for a junior attorney to meet someone who is this steeped in this amount of—this quantity of facts and law. She knew everything there was to know, not only about the specifics of this case but about the strengths and weaknesses of the Landmarks Preservation Law, where we’d have to be careful, where our case was strong. But what she dumped in my office was, I think, something like seventeen volumes of administrative record. I don’t recall the specific days but I think there were maybe three to five days of public testimony, then another three or four days of executive—I don’t know what it was called, public executive sessions or something. Then a few more days of closed to the public deliberative sessions, all of which were on the record, were transcribed. Then of course, there were volumes of submissions by lots of people. There were the experts retained by the church. There were experts that appeared—I don’t know whether they had been specifically hired by the commission or simply made available by other parties who were interested in opposing this application. I don’t really remember but what I do know is that there were plans, reports, submissions of all sorts as well as testimony from interested parties. So it was a huge volume of information. Dorothy of course knew it all backwards. She could practically recite it verbatim. But it had been carefully indexed and she sat us down and took us through all of the salient issues, pointed out the weaknesses. The commission people did a very careful planning of the proposed space and kind of matched it against what the church had done. Pines: —I mean it never came to blows—but there were times when you could see that it pained her to have to relinquish control over something that really she had nurtured through an extremely elaborate process. Q: So two things to maybe explore with you there. Do you remember any particular issues where you had to make a decision strategically about what to pursue or what to emphasize versus not? I don’t recall what it was specifically, whether it was something having to do with takings aspects that I think Lucy was developing in the brief. So I don’t know much. As I recall, the division there was I did a lot more of the factual development. In those areas, I took a lot of Dorothy’s points without dispute. Other things we had to address in a way that we were not terribly combated or confronted. And only in a few select areas where—the other thing that Dorothy did and this I do recall, she was absolutely painstaking with editing our written work. Q: Leonard Koerner said the same thing. Pines: Yes, and I recall she had perhaps more issues with Lucy’s work than with mine, I don’t know whether it was because Lucy was doing particular work she was doing but I do recall that drove Lucy a little around the bend at some point. I completely sympathized. I sympathized with both of them. I sympathized with Lucy because I know how crazy it can be when you’ve got so much work to do and a hand comes out and is quibbling about a semicolon versus a colon or whatever. I think that Dorothy was very much a control freak. In many ways, it served us wonderfully because no detail passed her notice at the administrative level. So anything that needed to be rebutted, she made sure that it was rebutted, so we had a competence of record. But that same virtue at the administrative level could be, not a vice, but a source of friction when you [unclear] that sort of thing. So those were really cases where the tempers might have gotten a little frayed just because we’ve got a lot of work to do, we’re under deadline. We’re doing everything you want us to do. Please don’t second guess us in choice of words. So I think maybe that’s what did it. Q: And too—as a fellow appellate lawyer and litigator—I appreciate too the importance of having to make strategic decisions of what to include and not include when you’re faced with this massive administrative record, everything can’t go into your legal briefing. Pines: Yes, that’s pretty much what it came down to. Q: You have to distill. Is Lucy Cardwell still working with the city? Pines: She’s not. I don’t know where she went. She left shortly after this case. I hope it wasn’t this case that drove her out. But I think—no, she had been in the office for a fair amount of time. A lot of attorneys, particularly back in those days when the market was a little more open, people migrated in and out. Lucy was eminently marketable as a litigator and an appellate lawyer too. So I don’t know, I think that’s why she moved on. Q: The other interesting thing you pointed out, that a lot of preservationists don’t appreciate is the importance of building that administrative record to allow future litigation to go forward, which you don’t always see happen. It sounds like you had the luxury of having a very well-developed administrative record that allowed you to do your work. Pines: We had both. We had both this incredible record and we had Dorothy who could give us a road map, without which it would have been infinitely harder to master just seventy lines of stuff. So yes, I’ve litigated many cases on records since then. I appreciated it but I developed an even greater appreciation in retrospect because as a litigator you know, oh God, I wish they had done this in the record book and because they didn’t, my litigating options and strategies are somewhat confined. I can’t make arguments I’d like to because the facts aren’t there. Q: Or error preservation issues. Pines: Yes, and it was all there. Everything, everything, everything was there. Pines: We were very lucky. Q: I’m sorry to jump around. I’m just trying to keep it fluid as we’re conversing. But do you remember any anecdotes or did you have any interaction with either the rector or wardens or members of the vestry at St. Bart’s during the course of your litigation or were you kept separate and apart from—? Pines: Pretty much kept separate and apart. I mean there’s this ethical rule prohibits—I mean there would be chance greetings in the court on motions and things like that. But no, I had no dealings with them at all. I did interestingly note—I can’t remember the group that you pointed out, you may remember. I know there was a group in the church dissenting, one of whom was a guy who happened to be on the board of trustees of my prep school—when I was at prep school. Sinclair [phonetic], I think, was his name. I don’t know whether it was his first or last name but he was this dapper gent. It was kind of funny to realize—this completely random crossing of paths. Q: It’s interesting; there was an amicus group to oppose the sale of the church filed at least in the Second Circuit appeal. Pines: Yes, there were a number of interested parties but there was an internal group that I think had interesting insights into how the church worked. But again, we didn’t have a lot of dealings. We did have some major meetings, I remember, at some white shoe firm and here I was, a young [unclear] who was representing the city, the commission. Before, I recall John [E.] Sexton, NYU [New York University School of] Law, he was there and other senior partners at big firms and I was trying to face them down because they were trying to take a moderately different reading of the law than I wanted to. So I remember those people. We worked with them in a very collegial way. But we pretty much charted our own course. We told them what we were going to do and they kind of filled out the field on the other things we didn’t do. But no, the people on the church side aside from this dissenting group, I had no dealings with. Q: Against the closed loop, you said you worked most closely with Lucy Cardwell. Leonard Koerner’s name appeared as an attorney of record too. Was that in his role as a supervising attorney? Pines: It’s possible. Len might have well reviewed the papers. He certainly was instrumental on the appeal record. I mean if his name appeared on the trial briefs that would probably have been because we consulted with him at some point. That’s a little unusual and Len’s not someone who sought to throw his name on things. So it might have been in the Second Circuit. I don’t really know. Certainly on the Second Circuit papers, Len would have been intimately involved and his name would have belonged there. I mean I would have his name on other papers but I would be surprised that it was there because usually it wouldn’t. Q: He had suggested that you were the right person to talk to about it. Pines: I love Len. He’s a great connector. Q: No, thank you for that. It’s very helpful background. So after the case was assigned to—you’ve had your review of the record. You’ve spoken to Dorothy Minor. You’re learning about preservation. Now you’ve got these two big constitutional issues to attack. How did you approach solving these questions? Q: Which are novel issues at the time. Pines: Yes, you’re talking about the First Amendment, free exercise and the takings issue? Q: Yes, and the takings issue. Pines: What I can tell you is that Lucy and I divided them up. I seem to recall Lucy taking the takings. I may have handled the First Amendment issue. I just don’t know. But I do remember—and the reason why I hesitate is because what I most remember looking back at this vantage point of twenty-five, thirty years on, is that I spent the bulk of my time on the factual record. So it may really be that Lucy and I consulted and I really developed—I mean if you look at the trial—I was just looking at the trial brief when I first heard from Liz [H. Strong] and recollected how much I don’t remember. But what I do remember, as I’m reading it, a substantial part of that brief was just describing the procedural administrative record and summarizing the facts which were quite detailed. So it may well be—unfortunately, I can’t recall. If I did anything, I would have done the First Amendment part of this case and Lucy would have done the Fifth, the takings issues. What I can tell you we did was we simply did what you always do. We basically started reading. Again, Dorothy was really conversant in this law. I wouldn’t be surprised if she started pointing us in the direction of the cases. So basically just rolled up our sleeves and started reading about them. I recall a case called Lyng [v. Northwest Indian Cemetery Protective Association] which had been at that point a recent First Amendment case that had been—I mean it was a takings case I think it had [unclear]. I don’t recall. I was hoping to reread it in preparation but just didn’t have the time. But we read those cases. We certainly read the state court cases involving the Landmarks Law that were certainly relevant—the hardship cases and others. I know—and I remember in Len summarized it in his interview, I remember Snug Harbor and others. I mean I recall reading those cases and coming to some degree of mastery, again, this is just by Dorothy. But that’s about all I can tell you. I don’t really know—we basically just constructed the strongest arguments we had. I think frankly we felt that—after talking to Dorothy, we felt that as challenging and as novel as the issues were, the church had really handed us on a silver platter a case that had such glaring weaknesses. In their meeting their burden of proof, I wouldn’t say we felt confident, but the church if it had done its homework, would have presented a much harder case than this one. I mean it was nerve-wracking and we had no guarentees. But the fact is I came to appreciate them— I came to see this was a case where we really hit on the facts as strongly as anything else. The burden of proof became—as I recall, one of the threshold legal questions that we needed to know was whether we would be able to convince the court that it should close the record—contain the record to the administrative record—or whether the plaintiff was going to be given an opportunity to supplement the record at the trial which would have been a bit of a nightmare. It would have been manifestly unfair from an administrative review point of view. It was not entirely clear whether from a constitutional point of view the court had the right of de novo review. But fortunately as I recall, the church—I think maybe they just didn’t want to spend more money, I don’t know. But they ultimately, I think, agreed with us that the record would be closed—the judges’ review would be confined to the administrative record. When we knew that, we knew a major hurdle had been eliminated. So as I said, I think the bulk of my work was on that point, just really developing the record, highlighting the really glaring—it was really not only showing that they had failed to meet the burden of proof, but it really fringed on bad faith. What they did was so threadbare, so haphazard. And so kind of transparently slipshod. It was embarrassingly so, I just thought, my god. I mean if I was choosing to litigate a case of first impressions, I would not have chosen this case. But you can’t choose your clients, I guess. Q: Well, I’m so glad you mentioned this burden of proof issue the way you did because this wasn’t terribly long after Penn Central had been decided, where the Supreme Court had announced its test and had made clear that historic preservation had a valid public purpose, that there was going to be a level of inquiry on investment-backed expectations. Of course this is a church, it would not have had development rights, expectations at the time it built the community house. Then the whole issue of the burden on the applicant, which it said that it needed X million in order to continue operating which opponents countered, I think, with experts that showed that wasn’t the case. There were these great factual discrepancies that seemed to come out in the administrative record that undercut the church’s argument. Pines: Yes, the financial arguments were weak but the more—I do remember, Lucy did focus on financials. So I think she did that analysis and the takings part because of the financial analysis that depended on. What I was focusing on was really appalling lacunae in the record, in their assessment of the planning into the space, the assessment of the actual physical structure of the building and the chronology of how they essentially contracted to develop the space before they had done space planning. So it became very clear in the testimony that was elicited—it was so damning—even their own space people said, “It’s very unusual to be called in after a building has been developed to plan space into it.” Normally, you speak to a client, get a sense of what they need and then develop the space. Q: So they really put the cart before the horse. Pines: Yes, they did that and then they had a number of things. They had an architectural designer whose only expertise had came out—had no preservation expertise or background at all. The only thing that we could determine—I think we went online if the Internet was even there, but we did some research and found that the only thing they had done, I think—I can’t recall, was it Mudge Rose [Guthrie Alexander & Ferdon] on the other side? I can’t recall the firm on the other side. I think it might have been Mudge Rose. Q: We’ll look that up. Pines: Whoever it was, what we determined was this architectural expert, the only work they had done was redesigning this law firm’s office space. So they had no expertise in historical preservation and rehab. So their assessment was so uninformed that one of the things I recall them saying was—they submitted a report where they said a number of things—do you see it there? Q: Mudge Rose Guthrie Alexander & Ferdon. This was the U.S. District Court for the Southern District on the New York level. Pines: Yes. So Mudge Rose also, I think, represented them at the administrative level. So there had been this firm, I don’t remember the name, but the firm that they had retained to do the assessment of the space and the current space in the community house was this firm that had no expertise in preservation. The only thing they had done is redesign Mudge Rose’s offices. Pines: And they showed that in fact they were—I don’t know the architectural terminology—but they were effectively just these kind of veneers of stone and within that were eminently moveable, flexible walls that could be taken out and moved without any—they were characterized by the church as load-bearing. They were not load-bearing. They were completely capable of being redesigned. So that was one glaring, embarrassing lack of expertise. They claimed that there would have to be massive destruction, that the building couldn’t be built upon, as I recall. The preservation experts, looking at the Goodhue designs found out in fact that it had been stubbed up so that it was contemplated to take an addition, without having to destroy anything. You could build on these existing stubs on the roof level. It was eminently flexible, it was designed for future development. Again, they had no sense of any of that. Their electrical people basically said you had to trash everything. You couldn’t do anything. We determined—the experts who the commission found—determined there in fact was lots of existing work that had been recently done, that could be built upon with minimal rehabbing. I mean there were a host of episodes, these are just some. But there were a host of things that were so—then of course, the space—I should really touch on this. There was a space design where they claimed that the existing space was choked with systems and rigid structures. Then they looked at the proposed building and what they found was that the central core of the proposed structure, this high rise, had a central elevator bank in the heart of this huge building. And the only space that was available to the church for use would have been sort of peripheral space around that and then basement space, subterranean space. When the commission took the church’s own assessment of its space needs and tried to plan it into this building, they basically found that the only way it would work was that if most of it would have to be underground which meant that anybody using that space would be bumping into people who would be using the high rise, that there was virtually no space. Some of the things they couldn’t plan in it at all. Basically what they showed was the existing community house was eminently more suitable for their expressed space needs. So basically it stripped away all of this pretense and revealed that the church’s presentation was borderline fraudulent. It was just—and emphatically so. It was easy—it really wasn’t hard. Again, it was easy for us because Dorothy had done the leg work, the commission had, to show how bankrupt, not the church’s coffers were, but how bankrupt their presentation was. They hadn’t even put enough effort into a veneer of respectability. It just became clear that their presentation was utterly without foundation. Q: I noticed in some New York Times reporting—this is from an article by David Margolick from January 31, 1984. It was entitled “The Church’s Fight on Landmarks,” in The New York Times, that at least in the original proposal, this fifty-nine story office building, the structure was going to include a new center with a theater, swimming pool, gymnasium, café and lounges on the first eight floors, that would pay for the ministries which the church was arguing were going to be jeopardized by lack of funds. I found another interesting article again from The New York Times. This was authored by David Dunlap, February 1, 1984, titled, “Battle of St. Bart’s Goes the Landmarks Panel,” where the bishop of New York, Paul Moore Jr. made the argument that—and I thought this was interesting—but the church itself will be threatened if St. Bart’s were not permitted to go forward with the development plans. And this is what he said, “Who would buy this beautiful church? Would it become a disco? Would it be torn down? Would it become a movie theater? The very building that the commission seeks to protect would be sacrificed.” It’s almost making the argument that—well, making the argument that if the community house plans were not allowed to go forward, that the church essentially would be allowed to fall down and become a disco [laughs]. Pines: And of course it was proven not to be the truth. Q: Yes, and that’s what was fascinating too. I mean there were all these dire predictions that the church was about to go under, which as you said, certainly was not the case. Pines: Yes, it didn’t seem to be the case. I mean St. Bart’s was well known to be a pretty well endowed church. There were those, again, I think some of the dissenters on the inside [unclear], I don’t recall, but I seem to recall [unclear] books. It’s not anywhere near as dire as they’re claiming. Plus they hadn’t really—my sense is that there was really minimal effort to try to fundraise, to do anything to mitigate what they were claiming was a dire financial pictures. We didn’t really get into the internal workings of the church. We stayed away and stayed within our purview which was the architectural issues, what the record was, and if the church presented enough credentials. It was that kind of case. Pines: Yes, was out of line. Q: Was out of line, right, right. I also thought it was interesting, again in the same article by David Dunlap, there was a lawyer for owners of a nearby tower who came out in the record and said, “There’s no First Amendment right to construct office buildings.” And this gets into the religious freedom aspect of your case. “I know of no faith whose major tenet is to construct office buildings.” I thought that was an interesting quote that really gave some pragmatic lift to your religious freedom argument that you were having to develop for the church—or sorry, for the city, in response to the attack by the church. Pines: The Landmarks Law doesn’t—you’re not allowed the best use anyway. But there just was insufficient evidence that their religious mission was impaired by what their current state was. It might have been a different case if they had shown truly that they could not continue, that whatever—I don’t even know. But that wasn’t presented fortunately. It was not quite so powerful. Q: Just to kind of build on what you mentioned about the failure of proof, to me, this case was also one step or more removed from Penn Central where at least in Penn Central, you have the developers seeking to demolish the landmark building itself. Here, the church is not trying to demolish the church where it practices its religion but an adjacent community house which again, I think, made the argument that this was frustrating their practice of religion that much more difficult. Pines: As I recall, I think the community house really was—I mean it wasn’t the worship area. It was part of—they claimed to be—that was part of their mission. That was where their home was, services were located as I recall. I mean it’s relatively kind of quasi-secular. They had concerts there and other things. I think they did claim that they used that space for part of their religious outreach. It wasn’t quite so cut and dry, the religious nature did extend arguably to that point. Q: But primarily the worship took place in the sanctuary. Pines: Yes, because somehow, it had a synergistic effect in some way. Pines: Yes, it hadn’t changed. Q: I didn’t notice from my reading of the opinions that the church was attacking the test. Pines: Yes, I don’t think they were. I think they were basically saying [unclear] as applied, they were basically saying this was going to constitute a taking because [crosstalk]. Q: Yes, this is where as you said, the development facts are probably absolutely key. Pines: Yes, I really do believe that had the record been different, it would have been—I’m not sure it would have determined the outcome but it would have been much closer, a much closer case. Q: Now on the—again, arguably, I think this religious freedom issue was the more novel of the two issues. Do you recall any precedent—and again, I know this is so long ago—that you were looking for or found especially helpful? Pines: I’m trying to remember, I do believe—I remember Dorothy and I talking about it, this Lyng case. I believe that was the case—I don’t remember, I think it had to do with the Native American religious practice. I can’t remember. But as I recall, it established the principle of every—it was one of the first, it may not have been the first but it was one of the first that addressed this notion that where an impact was incidental, that the government regulation could withstand a free exercise scrutiny. Q: This is U.S. v. Lee [phonetic], is that what you’re mentioning or Lyng? Pines: This is my wife, Janet, Will Cook. Pines: We’re taping here but that’s fine. Q: Thanks for letting me do this interview. Pines: I don’t remember if it’s U.S. against Lyng or Lyng against U.S. or whatever. I think that’s the gist of the case though—the notion of and incidentally impact on religious practices is not sufficient invalidate government regulation. I mean that was I think part of what we were saying here, the impact here—again if it had not been incidental, if the regulation had gone to the heart of the church’s ability to continue, I think the incidental ordinance would have not carried [unclear]—but I think that was one of the guideposts we used. Q: Did you argue the case at the district court level? Pines: It was never argued. It was actually only submitted. Pines: So that’s part of the reason. If I argued it, I think my memory might have been a little sharper. This was done on submission. Pines: Which frankly was a bit of a relief because with an administrative record this far ranging, I mastered what I had to master to get the brief, but my fear was—I mean Dorothy would have been there, she would have [unclear] under advisement—but my fear was the church would have come up with something out of left field and it would have been hard. But no, Judge [John E.] Sprizzo took it on submission. Q: On appeal, was it also decided on the briefs? Pines: No, I’m sure it was argued on appeal. Q: Do you remember who—you didn’t argue it? Q: Yes, Leonard Koerner, Jonathan Pines, Dorothy Minor—you’re all listed as counsel of record on the appeal. Pines: Okay, so Len probably argued it. But that would be surprising. I would have thought Len would have argued it in Supreme, but he would have had one of his people do it. Q: And that would have been the Cert Petition [Petition for Writ of Certiorari] that was denied. Pines: It just would have been submitted. It wouldn’t have been argued. I don’t really know. I don’t recall. Pines: Yes, I mean I can certainly look up the briefs. Q: Yes, and I meant to ask you if you had—this for example, it would be wonderful if we could add to the archives with your interview, the trial brief which is not electronically available. Pines: Sure. There were a lot of briefs, there was a lot of motion practice going into this case. Q: That would be fantastic. Pines: It was interesting although of limited interest to preservationists. Some of the arguments were about—as I recall, we kind of flip-flopped on—I can’t remember what issue we were flip-flopping on, whether the administrative record should be closed. I don’t know whether that was it or whether we thought the—this is kind of really in the weeds—but Article 78 which is a New York practice, it’s an expedited administrative review in the courts. So if a governmental decision is made, you can bring an Article 78 to challenge that, to determine whether it’s arbitrary and capricious. They grafted onto this constitutional case an Article 78 claim saying that the commission’s decision was arbitrary and capricious. We had fought at some point about severing that out, saying that the federal courts shouldn’t even be able to hear that by its very expedited nature. It’s a case that should be brought expeditiously because the idea is it’s a state expedited review. So if there are errors in the administrative record, it can be remanded to the agency quickly without delay. This case, the discovery of unrest dragged on for awhile. That is completely contrary to what an Article 78 review should be. I think it’s something where we said, “No, Article 78 should be severed from the case.” And then we thought maybe the Article 78 should be part of the case because it’s very deferential review. If the federal court applied this deferential review to the administrative record, maybe it’d be [unclear] caught up on the federal claims. So I think that’s where we initially said, sever it, and then we thought, no, maybe don’t sever it. Keep it in. But there’s a lot of those cases. There’s at least five, maybe four or five trial-level briefs. I have them all. I’d be happy to show them to you [crosstalk] decide whether they’d make it. Q: That’d be wonderful. Thank you. I appreciate that. Pines: But there’s a major pre-trial brief that has all the major arguments that you’re going to want to include [crosstalk]. Q: That would be wonderful to include with your interview. Pines: Now do you have the appellate briefs? Pines: Okay, I can get you those. Q: Thank you. Yes, a lot of these really interesting cases have still not been digitized by the federal PACER [Public Access to Court Electronic Records] system yet. They are slowly adding to the database but I’m not sure what the cutoff was for Second Circuit. Pines: It must be going back pretty far. Q: That would be really helpful. Pines: I will make a note of it. Q: I’ll follow up with an email. Q: Sorry, the plaintiffs had not shown that they could not fulfill their mission. And the other issue I wondered about had to do with—you were mentioning how important this case was in terms of the factual development. As you said or as we were discussing the fact that the church’s proposed development was taking place in the community house versus in the sanctuary itself. If you had been the lawyer for the church, could you think of something that you might have emphasized differently, that would have made the city’s—? Pines: I mean again the arguments were there. The church just hadn’t done the work in advance. I mean again, you’re right. There’s definitely a distinction between the sanctuary space and the community house but certainly, if they made a credible argument that their religious mission—there’s worship but their religious mission—they would have to show that inherent in their religious practice is community outreach, which I think they tried to do. But if they had made a stronger presentation about how—honestly it wasn’t even whether their religious mission was the outreach because they did make that argument. But if they had—their mistake was purely record development. The mistake they made, again, if they had retained their experts in advance of closing a contract on the development—Janet, is she taken care of here? I don’t want her on the sofa. Pines: Ok. It’ll be an interesting transcript. If they had done their homework and retained their experts first, so that made it harder for us to puncture the veil and get behind—it’s very difficult to call the church a liar. Truly, for the government to second guess a religious institution is not an easy thing to do. And courts certainly are not going to follow us down that path. Courts are very reluctant to side with the government when you’re talking about the credibility of a claimed religious mission. Q: It also showed a lack of due diligence on the part of the church. Pines: Absolutely. On part of the church and the lawyers. Any lawyer looking at this would be like, “Oh, my god, this is disastrous.” They basically sacrificed the strongest part they had which is we’re the church, the church operates in its sphere. The courts operate in their sphere. If they had just burnished that factual record in a way that made it harder to penetrate, they would have been in a totally different position. Again, I think we could have made the arguments we made because at the end of the day, they wouldn’t have been able to credibly claim they couldn’t do what they needed to do, because the community house was a very flexible and eminently adaptable building. Their job would have been hard but they didn’t even check the necessary boxes to get there. Again, would I have made different arguments? No, I would have made the same arguments but I would have made sure that the evidence and that the factual record supported them as opposed to undercut them. Because what they did was claim perfectly reasonable arguments but—it’s kind of ironic. It’s almost similar to their architectural reality, the underpinnings weren’t there. They just hadn’t done the work they needed to do, to justify what they claimed they required. So it was purely an error, I think at both [unclear] at the church level and at the lawyers’ level. Q: Yes, it’s almost as if—and again, I’m basing this sort of on press accounts that maybe the church was relying on the fact that it would be—or relying on the hope that it would be perceived as this very powerful institution. I mean it’s not a run-of-the-mill church. It’s a very prominent New York church, a lot of power and clout. Pines: Yes, I think there was a fair amount of arrogance frankly both on the part of the church and maybe on the part of Mudge Rose being a very powerful—that was [Richard M.] Nixon’s firm, not that [unclear]. This is a very well established, very well connected firm, very well endowed with lots of legal muscle. It’s ongoing fiction with the city is the Goliath and these applicants are the Davids. Technically, it’s not that way. Usually, it’s Mudge Rose against John Pines and Lucy Cardwell, ably assisted by the Landmarks Preservation Commission. But I mean the muscle was on their side and I think you’re right. I think there might have been a presumption that we got this one. But the thing is they had known that they’d been lacerated at the administrative—the cross examination of their experts was humiliating. Q: Which again, that wasn’t something that they could change before the U.S. District Court. They certainly weren’t going to be able to change that before the U.S Second Circuit Court of Appeals, even though I think they changed—yes, the church was represented by separate counsel on appeal, I believe. Pines: Oh, that’s interesting, I forgot that. Q: I believe. Let me make sure, sorry. There were so many parties in amicus [laughs]. Pines: I think Mudge Rose might have been on both but maybe not. Q: Okay, I was just looking—let’s see. Oh, you’re right, Mudge Rose was still involved. My apologies. Pines: Yes, I thought that. Q: I was just thinking sometimes firms change on appeal. Q: But again, they were going to be bound on appeal by what strategy they took during the district court level. Pines: Yes, they could have simply licked their wounds after the administrative process and gone back to square zero and done the analysis. But I think they kind of felt like—they already contracted for this space. I guess they felt we’re wedded to this plan, we might as well take our chances. But this is an expensive—I mean talk about a waste of money. Q: Yes, and then apart from I guess the failure of proof, this lack of legal due diligence, it also seemed—and again, one could argue this could have arisen out of arrogance or who knows why. There wasn’t much community input or neighborhood input in terms of the proposed design. We often see that that often leads to a lot of opposition. Pines: I remember that, yes. The chairman of the New York Landmarks Conservancy, Brendan Gill, said, “The plan that destroyed the architecture unity at the landmark’s site by demolishing the community house which was sensitively designed to harmonize with the style, color, texture, detail and scale of the church.” So again, apart from the financial issues and the legal part of the analysis, it seems like there was no attempt to come up with a compatible design. Pines: Or to harmonize with the height. Q: Or to harmonize the height, scale and mass of the existing structure but just to use reflective glass to reflect color. Pines: Yes, it’s basically an office tower, it’s just another anonymous block. Pines: The lack of sensitivity to any historical preservation—I mean they didn’t even give lip service to it. I mean that was certainly affronting to the commission. Again, it spoke to a kind of arrogance that we’re just going to do what we want to do. Q: Well, you’ve certainly given us some important lessons, not just about litigation strategy but due diligence and I think the importance of permit applicants to do their homework on the front end. In my work at the National Trust for example, I mean the biggest problems we encounter are often like this, where it’s not been an attempt on the part of a property owner to conduct this sort of legal due diligence that I think we give a lot of guidance on the front end, that arguably if had happened here, it would have made the city’s job a lot more difficult. Q: Thank you too for offering to share with us these trial briefs, appellate briefs, and I’ll follow up with you. Any other anecdotes or anything you’d like to leave us with? Pines: I certainly recall—I mean I remember at the end of the briefing feeling pretty good about our chances. You never know when you’re facing a big firm, what they’re going to drag out and what surprises may be in that record, in the arguments. I just remember thinking, well, I guess there’s really—you’re limited. You’re constrained by the record. So I remember feeling reasonably good about it. But again, I was a very junior attorney. I knew I was very naïve. Even now, I can’t foretell what’s going to happen. But I recall when we finally got Sprizzo’s decision and it was many pages and I remember turning to the end and seeing the result, just tremendously—I mean it really wasn’t personal because I truly do feel that we were doing Dorothy’s work. I just felt like, I guess in part relieved because I was very much aware how much was hanging on this. I knew that Dorothy was going to breathe a huge sigh of relief. But you just realize that as a litigator, sometimes you play a small part in a very big panoramic kind of picture. I just realized that if this had gone the other way, this would have been a very serious blow. So there was a fair amount—I mean I knew it was going to be appealed even if it went through but I just recall talking to Dorothy and her delight and relief at the outcome. And for a young kid, it was just an important win. It was a fun case. Looking back, as little as I remember about the particulars of the law. It was just one of those times where I just realized, this is a good profession to be in. Sometimes you just do work that really is gratifying and this was a time when the client was really zealous and had really done everything possible and kind of entrusted us with this incredible amount of labor. And we were able to kind of take that, shape it slightly and get to the next step. All I wanted to do was not screw it up. I was really glad that didn’t happen. Q: As a lawyer, it’s gratifying to hear you say that, all of that. And also just to let you know, this was an incredibly important case, not just in New York City, but it set a national precedent. And I think many attorneys in New York who work in the preservation area aren’t often aware that their cases here become persuasive authority in other jurisdictions because it’s very rare that you have a city preservation office as developed as New York because again, not every community has advocacy groups willing to go forward or local governments willing to go forward to help develop their local preservation law in a way New York has done. So we continue to cite to your work [laughs], not just New York but in other cities all across the country. Pines: That’s great. Another experience, I haven’t really focused on it since but I can only imagine what this Supreme Court thing, that the balance could have turned against us. So I’m apprehensive about the state of law. Q: Who was mayor during your case? Pines: I was just trying to think, I think this was probably [Rudolph] Giuliani. Q: Yes. And the other interesting thing you pointed out—or I guess this is in contrast with the Penn Central case era, where I learned from Leonard that there was this real moment when the city might not have moved forward with its appeal of that case to the Supreme Court of the United States. And largely because of the advocacy of Jackie [Jacqueline] Kennedy Onassis, there was a decision to move forward but it was not certain that the city would defend its Landmarks Law. So it’s interesting, maybe building on that success made it a surer thing that the city would pursue the litigation in this case, where again you had Penn Central Transportation Corporation threatening to bankrupt the city with its damages awards, St. Bart’s was certainly arguing it was going to lose between two hundred and three hundred million dollars. But it’s interesting to see that shift. Pines: There was a shift. Q: In administrations and their response to the litigation. Pines: Yes, I think the die had not yet been cast when Len was doing Penn Central and yes, Jacqueline Onassis definitely I know was instrumental. I remember a picture of her in Fred [Frederick A.O.] Schwartz’s office, the corporation counsel, there was a picture of them together. I know that she weighed in on that—or I guess actually it was Arnold Schwartz. So maybe it was a different one. But by the time this case around, there was not even a question. This was absolutely going to be defended. I chalk that probably as much to Dorothy’s advocacy as anybody’s but I think there was a greater feeling that we needed—we had won this major case. It was our obligation to continue to develop and defend the law. I never had any indication from anyone on high that we were not going to do this full speed ahead. Q: Well, Jonathan, thank you for your time today. You’ve, I think, added a valuable component to the historical record of this case. I certainly learned a lot from talking to you. Pines: Great, thank you very much. Q: Thank you. And thank you for the cappuccino.